We offer you Centauro Rent a Car’s car hire in Greece. It is an option that we are sure will captivate you. Greece is a millenary country full of mysteries and wonderful landscapes, the cradle of a civilization that spread throughout the Mediterranean and that is part of the foundation of our cultural background. We will help you find a driving route that realizes your aspirations of a unique, different, free and full of charm vacation. Driving a rental car is ideal to get to know first-hand everything Greece has in store for independent and curious travelers like you. You will discover hidden places and get where you want. Your trip will be truly unforgettable. Get ready to see the best of this mythological country that preserves hundreds of ancient treasures that you can reach by driving your rental car. The continental or peninsular Greece has a great archaeological interest and some singular and beautiful landscapes. The most famous places to see in this country are many, but there are also the most remote locations, where you will feel like a treasure hunter. The continental Greece is divided into three major regions, from bottom to top: the Peloponnese, central Greece, and the northern area comprising Thessaly, Macedonia, Thrace and Epirus. Athens, the capital of Greece, will transport you to the past in a journey going back 2,500 years ago, when this diverse city became the cradle of Western civilization. 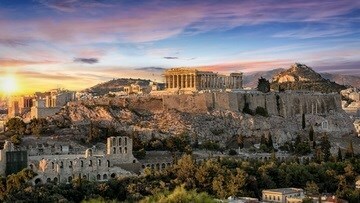 Marvel at the Acropolis of Athens, emblem of the city, where you can find the most important monuments of Ancient Greece and imagine what life was like walking around the Parthenon, the Erection and the Temple of Athena Nike. Visit the Plaka neighborhood, one of the most authentic of the city, with its shops and restaurants overlooking the Acropolis or visit the Monastiki neighborhood, the right place to do your shopping in the city. Other essential stops are the Archaeological Museum of Athens that houses most of the archaeological treasures of the city and the Agora, where the Temples of Hephaestus and the Stoa of Attalos still stand. The Peloponnese, to the south of the country, has many historical treasures. Its capital is Tripoli, located in the center of the region. To the north we find Mycenae, where the Lion Gate is located, which, according to legend, was built by the Cyclopes. The tomb of Agamemnon is also there, dating from the 13th century BC. Near the strait we find the ancient Corinth, a place of high strategic value in antiquity. The remains of the Temple of Apollo stand out. Other landmarks of this southern Greek area is the temple of Aesculapius or the theater of Epidaurus. Places of great importance are also here, such as the Oracle of Delphi, and Mount Parnassus, where according to mythology the Muses came to the call of Apollo. You can also stroll through charming fishing villages, such as Galaxidi, where you can eat or dine in one of its rustic taverns by the sea. Here also is Lepanto, in Greek Nafpaktos, where the famous battle took place in which Miguel de Cervantes fought. In the region of Thessaly we find the impressive monasteries built on top of steep rocks, such as the monastery of Metamorphosis, in Meteora, and five other monasteries still occupied by monks. And you can also stroll through port cities of ancient roots, such as Volos, near Mount Pelion, the mythical country of the Centaurs. The vast region of Macedonia has Mount Olympus, famous because it was believed to be the dwelling place of the gods, and the city of Thessaloniki, controlled by different civilizations over time, from the Romans to the Ottomans. The Greek islands are a beautiful mosaic of more than two thousand islands, of which only two hundred are inhabited. A paradise of crystal clear waters, as well as history and mythology. The island of Crete, where the adventure of Theseus takes place, in the labyrinth with its fearsome minotaur, is a very diverse place with paradisiacal landscapes. In the south you will find deserted beaches with turquoise waters. 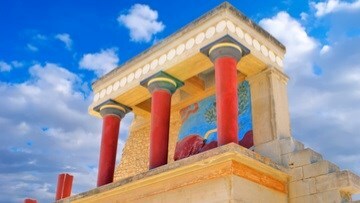 You can not miss sites like the palace of Knossos and some monastery lost in the mountains. On the island, the cities of Chania and Heraklion stand out. Corfu, known as the heart of the Ionian sea, is the place where Ulysses, the protagonist of the Odyssey, found Nausicaa. In addition to many idyllic places, you will discover monuments that will surprise you, such as the fortification of Kerkyra, its capital, or the temple of Hera. In Corfu lived the British writer Lawrence Durrell and his brother Gerald, author of “My family and other animals”, an autobiographical work that relive his time on that island. Santorini is the jewel of the Cyclades Islands, in the Aegean Sea. Its characteristic white and blue buildings are emblematic. It is a beautiful and harmonious place, where its steep coast stands out together with its volcanic dark sand beaches. Rhodes is full of mythological stories. Here was one of the seven wonders of the ancient world: the Colossus of Rhodes, a beacon that guided navigators. This is the island of Zorba the Greek, played in the cinema by Anthony Quinn, unforgettable dancer of the sirtaki. Rhodes has castles and fortresses, archaeological sites and beautiful beaches. The island of Kos is very close to the Turkish coast, with its beautiful beaches, especially those of golden sand in the south. There is no shortage of archaeological treasures, such as the sanctuary of Aphrodite or the Agora. We must also visit the tree of Hippocrates, the father of modern medicine. Greek drivers have a reputation for chaos, especially in Athens. That being said, in Greece you drive as in all of continental Europe: on the right. There are many gas stations, but keep in mind that their usual opening hours are 7:00 to 19:00, so be careful! Gasoline can be more expensive than in Spain, especially on the islands, such as Santorini. Pay attention to the speed limit indications, since speed radars are frequent. On Greek roads, speed limits for cars are 50 kph on urban roads, 90 kph on non-urban roads, 110 kph on motorways and 130 kph on highways. Parking is usually metered. This should not be ignored, since fines for improper parking can be very high. The signage is in Greek and also in English, although in isolated places it may be in Greek only. 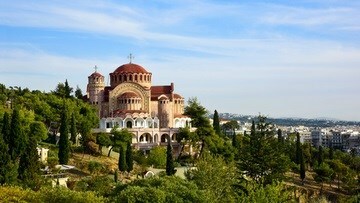 One more incentive for the unforgettable adventure of driving through Greece.